In Saxon times Hamstead Marshall was a cluster of dwellings above the southern bank of the river. Little is known of this settlement because no records survive from this era. However Hamstead appears in the Domesday Book of 1086, when it is in the hands of a Norman called Hugolin the Steersman. The population was counted as four villeins, eight smallholders (three with ploughs) and 10 slaves. The mill was also noted. Over the next 200 years Hamstead became important as the seat of the Earl Marshal, the monarch’s chief adviser and administrator. 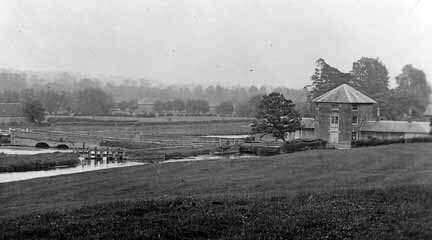 The manor of Hamstead was owned by several of these title-holders in succession, during which time the park was enclosed and a wooden motte-and-bailey castle built. Several medieval kings of England were known to have visited their Earls Marshal at Hamstead. 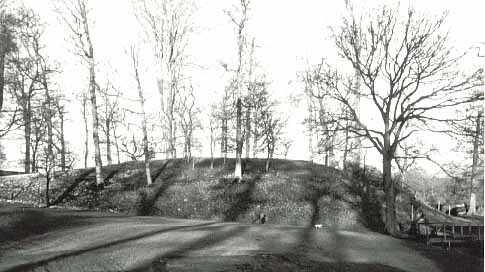 The castle has not survived, but its mound is now a protected historic monument in a private garden. During the fifteenth and sixteenth centuries the village centre expanded from around the church and mill to additional sites in what are now Ash Tree Corner, Chapel Corner, the Kintbury Road and Holtwood. It was probably the poor quality of local farmland that caused the village to grow in this pattern of dispersed settlements. Irish Hill counted as a separate manor in Domesday, but it was incorporated into the parish of Hamstead soon afterwards. Over the centuries it remained as a distinct, slightly isolated community in the north-western corner of the parish. However a fire destroyed several of the cottages in the 1920s, and this was followed by the closure of the nearby whiting factory, which had employed the inhabitants. Today, only two houses remain. In the early seventeenth century the manor was acquired by the Craven family, whose ownership of the entire village continued without interruption until the mid-twentieth century. The first Earl of Craven was a close associate of the Stuart royal family, and the story of his romance with Elizabeth, sister of Charles I and one-time queen of Bohemia, has entered local legend. 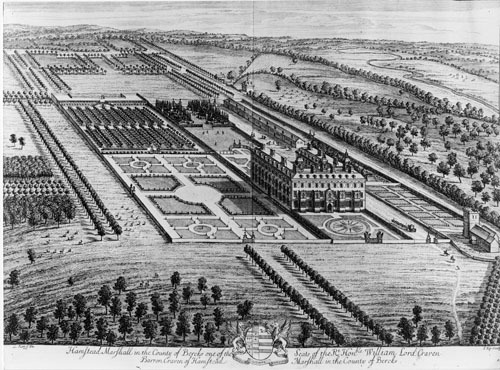 After the Restoration in 1660 William Craven returned to Hamstead and built a magnificent mansion, supposedly for Elizabeth, although she died during its construction. The house itself burned down just twenty years after William's death in 1697. The house was rebuilt, albeit less grandly, and it was probably occupied until the site was finally abandoned in the early nineteenth century. The Cravens chose a hunting lodge in the centre of the park to expand and remodel as their Hamstead seat. Hamstead Marshall continued to be the primary residence of successive lords Craven, although some chose to live in their other properties, such as Combe Abbey in Warwickshire and Ashdown House in the Berkshire downs. Several of the title-holders died young, an unfortunate trend which continued into the late twentieth century. The manor house in Hamstead Park was more often occupied by Craven widows than by Craven earls. Death duties took a heavy toll of the Craven fortune. A massive sell-off in 1934 disposed of many Craven farms, followed by further sales of family land, silver and pictures. To little avail. 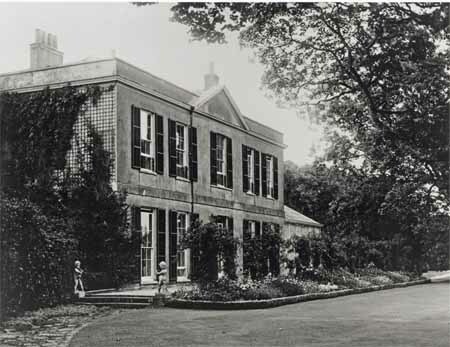 In 1967 the manor house was leased to a nursing home, and in the following decade many smaller Craven-owned houses in Hamstead were sold off. In 1984 the rump of the Craven estate in Hamstead was put up for auction. The buyer re-sold several houses, farms and the fishery, retaining the park and the manor house, which was converted back to private occupation when the nursing home lease expired. Today Hamstead's houses are mostly owner-occupied. The Craven connection survives only with the ninth earl's ownership of Morewood, a 300-acre sporting estate and house, which was re-bought by his trustees in the 1990s. Today most of Hamstead's 275 residents are relatively recent incomers, and very few of them work on the land. 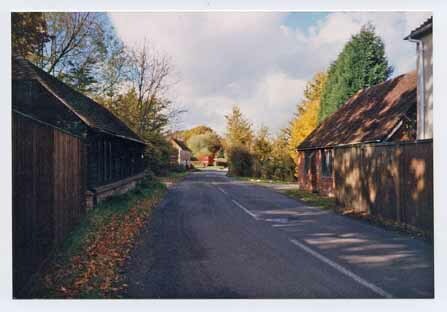 There are however descendants of some of the former Craven tenant families living, if not in this village then close by. The White Hart Inn, which has served the village for centuries, reopened in 2019 after a three-year closure. St Mary’s Church and the village hall continue to be well supported, and the village is still a predominantly farming environment.